The Chemical Reactions SciPack provides an initial context by describing the abundance of chemical reactions in the surrounding world, then relates chemical reactions to electron configurations, describes bonding, and outlines special bonds among carbon atoms. 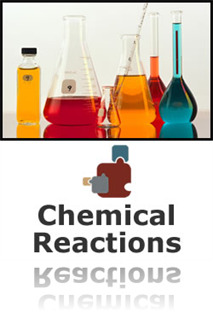 It describes various types of chemical reactions, outlines the importance of factors such as timescales, concentration, pressure, temperature, molecular configuration and catalysts on chemical reaction rates. Finally, the SciPack relates chemical reactions to energy input and release, and connects reactions to the conservation of matter. This scipack is a very in depth look at chemical reactions. In fact, I think it may be too in depth for me as a middle childhood teacher, but overall this is a very good resource. The structure of the SciPacks really help me understand the underlying concepts that surround each topic. Initially, I was unsure of how well I'd grasp scientific concepts in a self-paced, online format, but the carefully sequenced topics, interactive activities and simulations, in addition to the voice-over explanations work well together to help deepen my understanding in the content area. Especially valuable are the pedagogical implications and common student misconceptions. I feel a lot more knowledgeable about a subject after using a SciPack, and I highly recommend the Chemical Reactions SciPack to anyone needing to learn more about scientific topics! This is a very in depth review on chem rxn's. I thought the assessment was a little to difficult to be honest. I enjoyed this Scipack! It had a great presentation of information. It was not an overload of facts and it was very clear in its presentation. After taking a biology class last semester, I felt as though it brushed up on facts I had already known (such as periodic table). I teach high school chemistry and I really liked the way this SciPack broke down oxidation-reduction reactions in a way that made it easier to learn. I will be using a similar format when I introduce my students to them later this year. Chemical reactions are very abstract to students. They involve particles that can't be seen, and in some sense can barely be imagined. The animations in this SciPack help provide a good conceptual basis for what is taking place in chemical reactions. I especially appreciated how it showed the formation of a hydrogen ion. Many students have conceptions of protons being locked up in the nucleus and wonder how one could ever get free. The video here helped illustrate the concept. I thought that this would be a quick review of what I already knew. I was surprised at the depth of understanding that was given. It went into details and the explanations and interactives were done very well. I think that anyone of any level of understanding of chemistry would come away with a great deal of learning. Excellent Resource. Takes a challenging topic and although wordy, provides great simulations, interactives, graphics/diagrams, to hook and hold the attention of the viewer. Good refresher of information for me (Chemistry minor), but the content is very applicable to my teaching situation (middle school- chemical interactions module). I appreciate the pedagogy information provided, as I have definitely garnered ideas to use with my scholars in the laboratory. This is for me the most theoretical lesson. Very abstract but great brain exercise. I am amazed how the concepts of this material were absorbed by my brain, especially after having completed several scipacks already. It has been a while till I took college chemistry. This was a great review that helped me prepare for the science composite 8-12 class. I feel it really helped. This scipack was very well put together. I had no problem understaing the materials and it was a breeze passing the final assessment! I have not yet finished, but so far, this Sci guide uses a variety of visual examples that help make a very abstract concept a lot more accessible. The analagoies used to describe the stability of an atom link known concepts to new concepts to help make connections. Each level builds on the last, and the questions are challenging, forcing the student to go back and reread the content. Overall great so far. Overall, I thought this course was excellent. I had some trouble understanding the oxidation reduction reactions, specifically being able to differentiate oxidation reduction reactions simply by looking at the reactants and products. The free radical part was outstanding! It is a good review but at times some of the descriptions were confusing or went into more depth than was needed. Goes much deeper into types of reactions than what is useful when teaching middle school. I have found the simulations of experiments and demos I can do with my own students to be very extremely helpful. This is my 15th year teaching chemistry as both a special education teacher for 11 of those years and a general education teacher the last 4, yet I am finding a lot of new ideas and strategies to make the abstract more concrete. For example, the ball on the track...easy to use the same demo in class. This is a great review for me. I took chemistry classes a few years ago in college and am now teaching it for the first time. It's great to have this as a review (it's like a mini-chem course). Loads of inforamtion relative to standardsa on 5th grade CRCT. Although explained decently, the content was very high-level. The assessment was terrible. The wording is unclear on several questions and most are a "choose all correct answers" format which took me about 15-20 minutes to decipher through and research each answer for each question. This scipack took me closer to 20 hours than 10 and I definitely would not recommend it to anyone else teaching elementary grades. This sciPack is very informative for those who are studying chemstry. I will say, however, that the assessment needs a little work. Many of the questions are check all that apply, which can be very difficult for a student like myself. I beleive that NSTA should change the format of the test by either decreasing the amount of check all that apply questions or give points for those checked right instead of not getting any credit for the answer because he or she did not check all the correct ones. Other than that it is a great way to learn all about chemical reactions and other chemestry facts! I thought this SciPack was extremely difficult. I don't know if it is just because I have been out of school a few years and forgotten a lot, or if I just don't remember. For me, the most difficult part of this SciPack was the fact that nearly all of them were "Check all that apply" and matching. I really struggle with these types of questions. I felt confident, since I had studied the SciPack for several hours a day over the past few weeks, but once I read the questions, I didn't feel nearly enough prepared. I wouldn't recommend this SciPack to anyone, even with a highly knowledgeable science background. I thought this SciPak was hardest of 9 that I have taken. I am a Biology and Chemistry major. The questions are worded poorly, and the assessment uses "choose the best answer" several times. I would not reccomend this to any Elem. teachers, unless they have a strong science background and are confident in basic highschool chemistry.